Whitecap Publishers have just launched the revision of my Comfortable Kitchen Cookbook which was first published in 1991. So many readers have said this is a favourite book that is falling apart from use, I knew it needed redoing. Whitecap have done a handsome revision that is stronger and more colourful with many colour photos of the recipes themselves. The recipes are not greatly changed, so all your favourites will be there plus more colour. Formac Publishing Company has just released a 2015 version of my vegetable cookbook that was first published in 1983. Rose Murray’s A-Z Cookbook contains all the important information that the earlier book gave…history of each vegetable, how to choose it, how to store it, how to cook it, how to preserve it…but contains much more, and everything is updated. All the vegetables are still those grown in Canada, but there are some new vegetables now grown here. A few of the 1983 recipes have been removed because they are no longer relevant, and in their place are one hundred new recipes that reflect the ethnic growth of Canada. The A to Z format is still there with a clean design and beautiful illustrations to help you find a vegetable recipe quickly. It will probably become the only vegetable cookbook you will ever need. Robert Rose has just reprinted two of my titles: 125 Best Chicken Recipes and 125 Best Casseroles and One-Pot Meals. Look for new covers and new pictures as well. This beautiful hard cover book showcases the great range of food this country has to offer in recipes too good to forget. Full of beautiful photos of Canada, it highlights not only well-tested favourite recipes, but is also a celebration of Canadian cooks and their “taste memories”. Legendary writers Rose Murray and Elizabeth Baird have travelled the country seeking out more than 160 quintessentially Canadian dishes that show our culinary heritage. It’s dedicated to “cooks across Canada who keep the flames of home-cooking alive and welcome family and friends to share their best-loved dishes”. Canada’s Favourite Recipes won gold in the national Taste Canada Food Writing Awards 2013. What is Canadian cuisine? This question has become something of a national riddle. In her new book, A Taste of Canada: A Culinary Journey, veteran cookbook author Rose Murray shows us just how distinctive Canada cuisine really is and how our land, climate and people shape it. Featuring beautiful food and landscape photography, captivating essays about Canada’s regions and delectable recipes, A Taste of Canada is a true celebration of Canada and its culinary foundations. The easy-to-follow format features classic dishes updated with simplified methods and exciting new ingredients. A Taste of Canada was shortlisted in the 2009 Canadian Culinary Book Awards. Spiced with reminiscences and culinary wisdom, Hungry for Comfort invites readers into Rose’s cozy kitchen to listen and learn. With sections devoted to soups, casseroles, stews, roasts, menus for family celebrations and casual entertaining, coupled with Rose’s stories about the joys of cooking and the methods and secrets of her grandmother and mother, Hungry for Comfort feeds both body and soul. 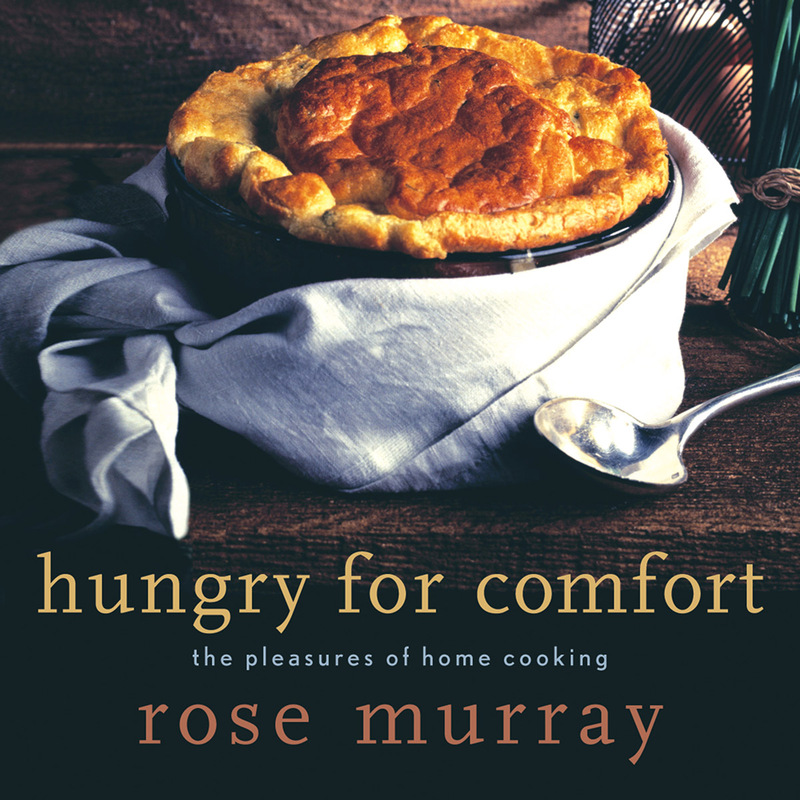 Hungry for Comfort won gold in the 2004 National Culinary Book Awards for best cookbook and bronze for culture as well. h a minimum of fuss and maximum taste. Convenience, easy preparation, economy and portability make this method of cooking invaluable today. From stews that will fill your house with irresistible aromas to the combination of a few ingredients joined together in a skillet, these are the appeals of one-pot meals. In the 125 Best Casseroles and One-Pot Meals cookbook, Rose Murray provides more than 125 well-tested, make-ahead casseroles and one-dish meals. Many of the recipes have been created to appeal to both earthy and exotic tastes. Here you will also find invaluable casserole hints, recommended dishes and pans, and even hints for making the best stews and chilies. From the comforting warmth of pot pies to outstanding entertaining ideas, this is one of the best cookbooks on casseroles and one-pot meals. In today’s busy households, chicken has become a standard meal for millions of people who want really good food in a hurry. With 125 Best Chicken Recipes, you can enjoy more than 125 different ways to prepare delicious and inspired chicken dishes — all in record time. Whether you use a skillet or sauté pan, oven or grill, most of the recipes can be prepared in 20 to 30 minutes. Here’s all the flavor of great chicken dishes and in very little time — there’s no better cookbook on chicken. Please Help!! I cannot find a copy of “A Year in My Kitchen” anywhere to buy. Just have to have it. Can you help me to purchase a copy? I have tried every resource I can think of. Sorry. I will look into whether there are any copies of “Poulet Express” left. The book “Quick Chicken” was reprinted as “125 Best Chicken Recipes” (Robert Rose). I do have a few copies of the French edition, and would be glad to mail you one. I’ve been searching online and at cookbook stores for a copy of “A Year in My Kitchen” but have not had any luck. Can you please tell me where I can find a copy? Sorry. I think it might be on their website now. I would like to send this book Canadian Favourite Recipes to my son in Missouri. Where can I order it? Where are you located? It is in all the bookstors and Costco. If your local store doesn’t have it, have them order it because the book is readily available. Where can I get a copy of Canada’s favorited recipes, in French? I have been raving about your book,Cellar and Silver to a friend, telling how many of the meals I make from it. Where could I find a copy to give her? It is one of my main go-to books when I’m entertaining. Taste of Canada or Canada’s Favourite Recipes? They contain good family recipes as well as lots of entertaining ones. Thank you for your kind words, and I’m sorry I can’t help. We moved to Ireland three months ago. Most of our belongings are still in storage until we take possession of our new home in July. One of my favourite cookbooks is a Rose Murray One pot book. There must have been more than one edition because my friends who have a similar Rose Murray are missing a smoked salmon corn chowder which is utterly delicious and has got us through many cold winter evenings. Can you please tell me how I can get that recipe before July. There are many other recipes in that same book that are excellent but the chowder is in a class by itself and we miss it. Help please. My husband worked at a market in Cambridge with his dad, Howard Nigh, who was also a butcher vendor at the market back in the 90’s. I was never really a great cook, however grape up in a restaurant with Italian grand parents. My then fiancé had Rose Murray sign that comfortable kitchen cookbook and some of my family’s most favourite meals have come from it. All slopped with sauces and fingerprints, I just used it again today and think fondly of that time! Thank you to Rose and her family for a life long commitment to amazing meals. Thanks Lisa. I am pleased you are among the many who say my Comfortable Kitchen book is their go-to cookbook. The revised version has all the same recipes (some updated where necessary), but it has a sturdier cover and many coloured photos of the food. Enjoy them. Hi again Lisa. We not only remeber Howard Nigh, but also remember his delicious sausages which we regularly bought. Cheers, Rose.